Calculate pH of solution prepared by mixing 10 mL of 0.1M acetic acid with 15 mL of 0.1M diammonium hydrogenphosphate. pH calculator is another important module of Buffer Maker, able to deal with virtually every solution containing mixture of acids and bases. Calculation of pH can yield third degree polynomial even for the solution containing one weak acid. When number of dissociation steps grows, or when number of substances grows, calculations becomes more and more difficult. With Buffer Maker built in pH calculator finding pH is pretty easy. Let's see how to calculate pH of solution defined above. If done manually, that's not a trivial task, as we have a mixture of three weak acids, of which one is triprotic. In general case that leads to 7th degree polynomial in [H+]. As usual you can try to find simplifications and approximations that will make the degree much lower, but calculations will be still tricky. Setting up parameters of such a solution in Buffer Maker is always fast, but in this particular case it is very fast - as both subtances can be fetched directly from the Buffer Maker reagent database. When the substance is not in the database, you can just directly enter its formula. Click on new pH calculator solution button on the tool bar to open pH calculator dialog. Click database button to open reagent database and select acetic acid. Enter 0.1 into concentration edit field. From the drop down list right to the solution volume edit window select sum volumes. Enter 10 into volume edit field. Acetic acid is ready. Click Add reagent button. New reagent tab appears. Once again use database button, this time to fetch diammonium hydrogenphosphate. Enter 0.1 into concentration edit field and 15 into volume edit field. That's no joke. Several clicks and entering four numbers is enough to setup the solution - and all calculations are done automatically. Now you can not only see what the pH value is, but also all concentrations of individual ions, ionic strength, activity coefficients and more - and you can export these information to spreadsheet or print it for a further reference. pH calculator built into Buffer Maker uses the same powerful pH calculation engine, used by the buffer design module. 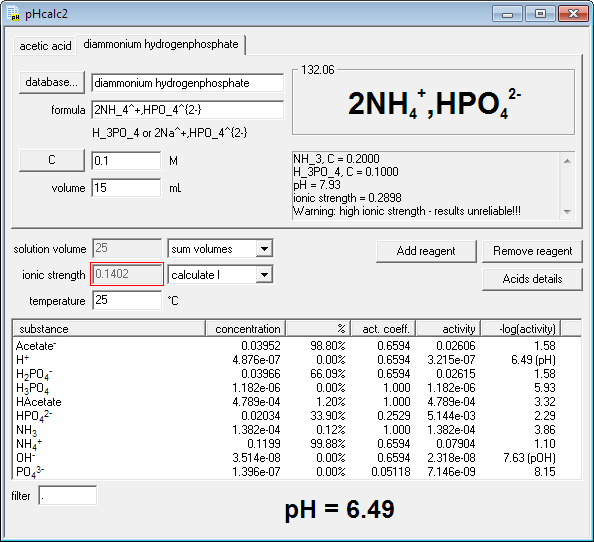 If you are looking for tool to calculate titration curves, check out our earlier pH calculation program, BATE.